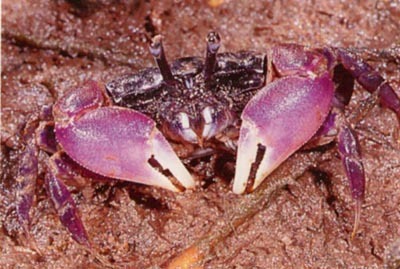 Similar shape to Fiddler Crabs but differs by having equal sized, purple claws. Common name refers to characteristic waving display used during courtship and territorial defence. To 25 mm across. Burrows in mud of sheltered bays and estuaries, mid to upper intertidal zone. Habitats vary from creek banks to saltmarsh. Indigenous, Eastern Australia from Tas., to central Qld.